Lars Gerrild Sørensen, Head of Banking Services. The issue of the 1997 series commenced on 10 March 1997 with the debut of the 200 kr. denomination, issued to bridge the gap between the 100 kr. and 500 kr. denominations. Commencing on 27 November 2002 the Nationalbank improved the security features for future banknotes of the 1997 series, starting with the 100 kr. denomination. A new series of notes is currently being issued: Banknotes of Denmark, 2009 series. The first was the 50 kr. banknote on 11 August 2009. Issued on November 22, 1999 – updated on November 27, 2002 – out of print as of May 4, 2010. The Danish 100-kroner bill (DKK100) is a denomination of Danish currency. Danish composer Carl Nielsen is featured on the front side of the bill and a basilisk from Tømmerby Church is featured on the reverse. This version began circulation on 27 November 2002. The face of the banknote has a portrait of the composer Carl Nielsen (9 June 1865 to 3 October 1931). Carl Nielsen was an orchestra leader, conductor, and music teacher, but above all a very versatile composer. He is known for writing operas such as Maskarade (1905–1906), and many symphonic works. 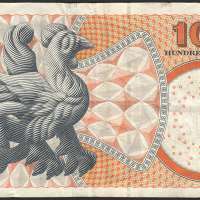 The reverse of the 100-kroner banknote shows a basilisk from Tømmerby Church in Vester Hanherred in northern Denmark. A basilisk is part snake, part dragon, and part rooster. Basilisk means "little king" and the figure is recognisable by its crown. Around half of all Danish banknotes in circulation are 100-kroner banknotes, making it the principal banknote in the series. 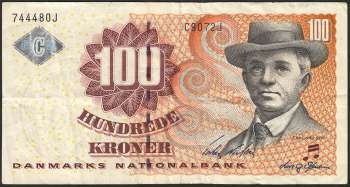 The 100-kroner bill is sometimes referred to as a hund (Danish for 'dog'), from a shortening of the word hundrede (a hundred). 100 kroner: Hologram: Two musical notes, the Roman numeral "C." and the number "100." When the note is tilted the "C" grows larger and a rainbow appears. Using a magnifying glass, it is possible to see a microprinted "100" in the outer line around the letter "C." Fluorescent effects: Basilisk on obverse and orange print on the reverse. Watermark: Carl Nielsen. Fact: Around half of all Danish banknotes in circulation are 100 Kroner banknotes.